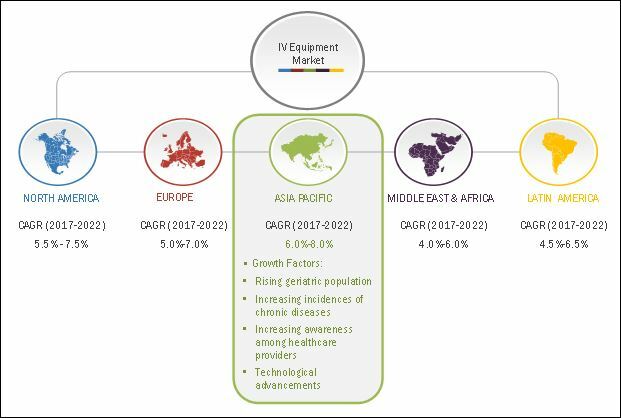 [166 Pages Report] The overall IV equipment market is expected to grow from USD 10.07 billion in 2017 to USD 13.64 billion by 2022, at a CAGR of 6.2% from 2017 to 2022. Intravenous (IV) therapy devices are used to administer liquid substances directly into a vein. They can deliver nutrients or medications such as insulin or other hormones, antibiotics, chemotherapy drugs, and pain relievers. Presently, many companies are developing various infusion devices capable of being integrated with alarm devices, monitoring devices, and data exchange systems. This integration helps prevent an overdose or reduced dose of infusion solutions to patients and minimizes dosing errors. Major players in the market are focusing on achieving system interoperability of the IV equipment such as infusion pump with EHR technology. The base year considered for the study is 2016, and the forecast has been provided for the period between 2017 and 2022. The global burden of chronic diseases such as heart disease, stroke, cancer, chronic respiratory diseases, and diabetes is increasing rapidly. According to the World Health Organization (WHO) 2015, chronic diseases accounted for approximately 60% of the total reported deaths in the world. The proportion of the burden of chronic diseases (chronic non-communicable diseases) is expected to increase to 57% by 2020 from 46% in 2001. The risk of chronic diseases increases with age. Among the geriatric population, the prevalence rate of chronic diseases is 64 per 1,000 persons. According to WHO, the global share of the geriatric population (aged 65 years or above) increased from 7.3% in 2005 to 8.7% in 2017 and is expected to continue to grow as a proportion of the world population, reaching 9.3% by 2020. This unprecedented growth in the aging population across the globe has also resulted in an increased burden on the healthcare industry. The rising incidence of chronic diseases, mainly due to the increasing aging population, and the growing use of IV therapy in their treatment are expected to drive the growth of this market in the coming years. During this research study, major players operating in the IV equipment market in various regions have been identified, and their offerings, regional presence, and distribution channels have been analyzed through in-depth discussions. Top-down and bottom-up approaches have been used to determine the overall market size. Sizes of the other individual markets have been estimated using the percentage splits obtained through secondary sources such as Hoovers, Bloomberg BusinessWeek, and Factiva, along with primary respondents. The entire procedure includes the study of the annual and financial reports of the top market players and extensive interviews with industry experts such as CEOs, VPs, directors, and marketing executives for key insights (both qualitative and quantitative) pertaining to the market. The figure below shows the breakdown of the primaries on the basis of the company type, designation, and region considered during the research study. In 2015, Becton, Dickinson and Company acquired CareFusion Corporation (US). The combination of these two companies’ complementary product portfolios offered integrated medication management solutions and smart devices, including infusion pumps. In 2017, BD launched a new IV medication safety solution at the European Association of Hospital Pharmacists (EAHP, Cannes) congress to improve patient safety. This product is designed to prevent medication administration errors. In October 2017, ICU Medical, Inc. acquired Pfizer's Hospira infusion systems (HIS, U.S.) business segment with a comprehensive portfolio of complete IV therapy from pumps to solutions. What are new application and technology areas which the IV equipment companies are exploring? The overall IV equipment market is expected to grow from USD 10.07 billion in 2017 to USD 13.63 billion by 2022 at a CAGR of 6.2%. 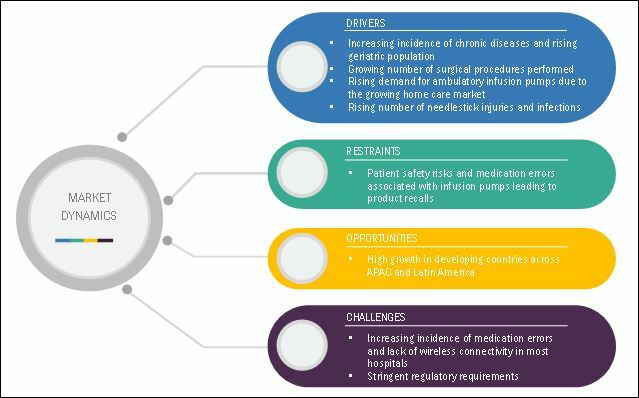 Increasing incidence of chronic diseases and rising geriatric population, growing number of surgical procedures performed, rising demand for ambulatory infusion pumps due to the growing home care market, rising number of needlestick injuries and infections are the key factors driving the growth of this market. Intravenous (IV) therapy devices are used to administer liquid substances directly into a vein. They can deliver nutrients or medications such as insulin or other hormones, antibiotics, chemotherapy drugs, and pain relievers. These devices offer significant advantages over manual fluid administration, including the ability to deliver fluids in very small volumes and at precisely programmed rates or automated intervals. These devices are also used for blood transfusion. 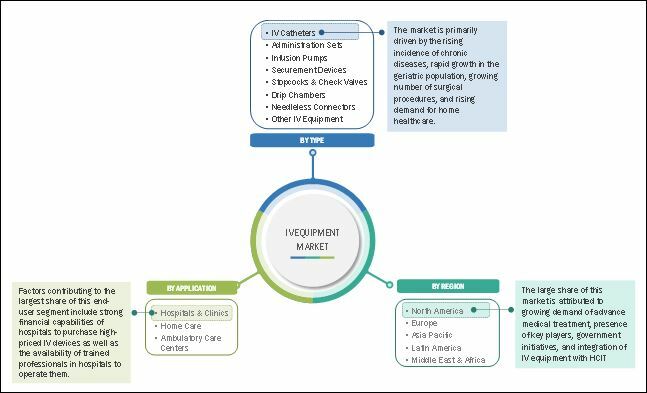 The IV equipment market has been segmented, on the basis of product into IV catheters, administration sets, infusion pumps, securement devices, stopcocks & check valves, drip chambers, needleless connectors, and other IV equipment. The market for securement devices is expected to grow at the highest CAGR between 2017 and 2022. Increasing adoption of central venous catheter securement devices and peripheral IV catheter securement devices during IV therapy owing to the advantages such as water resistant and can be repositioned upon initial application. The IV equipment market in APAC is expected to grow at the highest CAGR during the forecast period. The demand for IV equipment and accessories in the APAC region is majorly driven by factors such as the large population base in the region, rising geriatric population, rising incidence of chronic diseases, improving accessibility to advanced healthcare facilities, rising healthcare spending, growing penetration of health insurance, increasing demand for advanced technologies, growing investments in emerging APAC countries by key market players, and expansion of private-sector hospitals to rural areas. What impact will the market dynamics have on the IV equipment market in short term and long term? What are the industry trends in IV equipment market? Product recalls is a major factor restraining the growth of the market. Many infusion pumps are used to administer critical fluids, including high-risk medications. Errors with the use of these systems can cause serious harm to patients and may even lead to death. According to the Institute of Medicine (U.S.), approximately 1.5 million patients annually experience medication errors costing USD 8,750 per PADE (Potential Adverse Drug Event). Among medical devices, infusion pumps have one of the highest recall rates. From 2005 through 2009, the FDA received approximately 56,000 reports of adverse events associated with the use of infusion pumps, which resulted in numerous injuries and deaths. During this period, manufacturers recalled 87 infusion pumps to address the identified safety concerns; 21 companies were affected by recalls for infusion pumps and related equipment between 2003 and 2013. A significant portion of the recalls was attributed to faulty device design. The recall of products due to safety and efficacy failures is a key concern for device manufacturers and significantly affects the growth of this market. 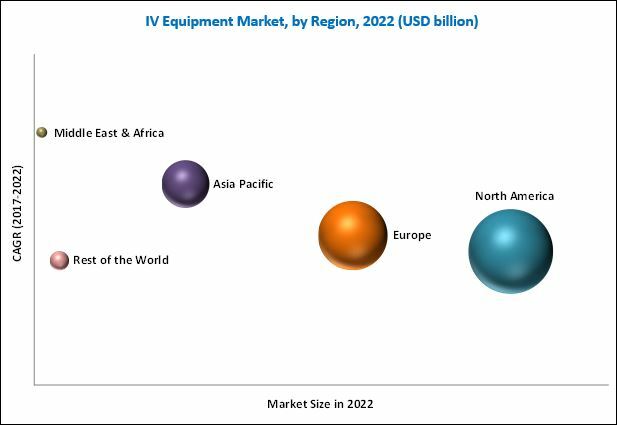 Some of the prominent players in the global IV equipment market are Becton, Dickinson and Company (U.S.), B. Braun Melsungen AG (Germany), Baxter Interanl Inc. (U.S.), Fresenius SE & Co. KGaA (Germany), ICU Medical, Inc. (U.S.), Smiths Medical (U.K.), C. R. Bard, Inc. (U.S.), Terumo Corporation (Japan), Moog, Inc. (U.S.), and AngioDynamics, Inc. (U.S.). These players adopted both organic as well as inorganic strategies such as product launches and enhancements, collaborations and agreements, acquisitions and grant to sustain in this market. Table 39 Key Market Indicators: U.S.
Table 60 Key Market Indicators: U.K. Figure 27 Global IV Equipment Market Share Analysis, By Key Player, 2016.